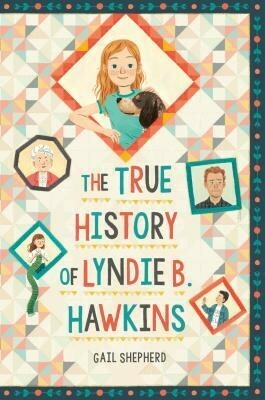 The lives of Lyndie B. Hawkins, daughter of a Vietnam Vet with a drinking problem and D.B., juvenile delinquent and foster child are about to cross paths. Lyndie, her mother and father and dog Hoopdee have had to sell their house and move in with Lady and Grandpa Tad. Lady runs the show with a list of infinite rules and schedules. There's very little room for truth or love. D. B. has had the good fortune to be fostered by Lyndie's new neighbors, the Spurlocks. Their daughter, Dawn, is Lyndie's good friend and luckily is in her class at the Covenant Academy. D.B. does not ever want to go back to the juvenile detention center that held him. It's dangerous there. Boys die there. Lyndie is fighting battles. At home she's up against her grandmother, Lady, who believes that eating a formal breakfast and talking about the weather will give a family the backbone and structure that can contain all pain and anger. The family follows the guidance of never talking about what is really going on in the home. Windows can smash and the smell of whiskey can invade every space but the formalities shall be honored and the secrets shall be kept. At school Lyndie is assigned to a group project with three other students, D.B., Dawn and a third guy, Peewee. Peewee is pretty much Lyndie's sworn enemy so Lyndie pairs off with D.B. to write his narrative meaning she has to get to know him pretty well and maybe even learn some of his secrets. This is a story about how we tell our stories. The stories of ourselves, our families our communities and even the story of our nation - our history. Seems we don't always dig in and get to the real truth. Seems to try to gloss over things that are just too painful to reveal or revisit. Told in layers, this is a book that respects our children. This is a book that isn't afraid to put it out there. This is a revolution in print with a quilted cover. It challenges each of us to know our truth and to face our truth whether it's in our family or in our community or in our history books. Good things come when we are willing to feel the pain and bring the mistakes into the light. This is be a tremendous read aloud in the 5th and 6h grade. A one-of-a-kind voice lights up this witty, heartwarming debut set in 1985 Tennessee about the power of homespun wisdom (even when it's wrong), the clash between appearances and secrets, and the barriers to getting help even when it's needed most. Determined to mold recalcitrant Lyndie into a nice Southern girl even if it kills her, her fusspot grandmother starts with lesson number one: Family=Loyalty=keeping quiet about family secrets. Especially when it comes to Lyndie's daddy.